The location was in the street in front of a moderately priced hotel in downtown Washington DC. The "Take It!" came as I returned from my visit to the lobby of this hotel to my car. I had seen some of this on my way in as I have become very interested in the random markings that are formed by fluid leakage from vehicles upon asphalt and some other surfaces. 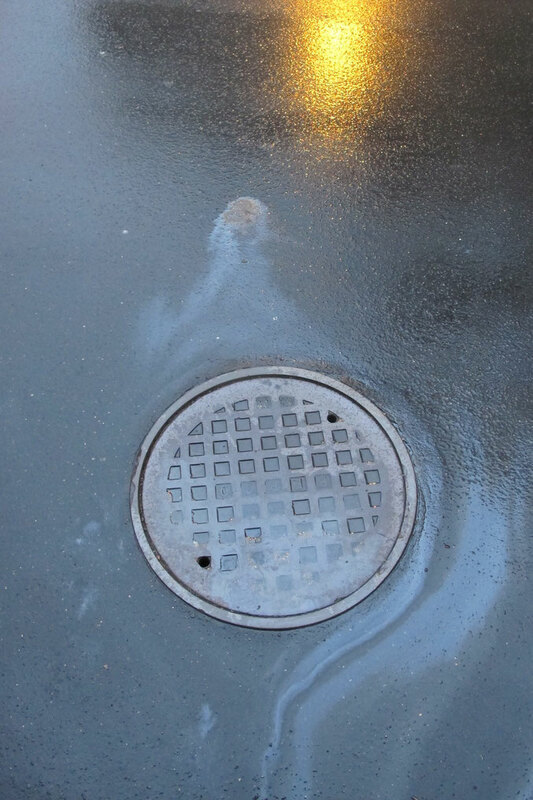 The composition of this photo is rare as the leak and residual puddle of fluid was located in a position to allow the spill when diluted by rain to move in a manner that brought it to the contour shaped to accommodate the man hole cover and move beyond until it ran out of mass to lay down its colorful print. The curves involved add intrigue to the photo. The reflection of the street light with the texture brought to this part of the image - as being all a part of a painting that I am ready to believe is an art form, all done through random circumstance. The After Take: I have shown this photo to numerous people and all have taken long pause before making comment. Few have had to ask what it was, as this sight is ever so common to all of us, ( especially city dwellers ). The primary response was "This is art" It was with a certain reluctance that most said they thought that it was beautiful for it is founded in pollution and is basically toxicity on the move. Here is the hope that all of us will ask for the mechanic that changes our oil or fills the various ports for different fluids in our vehicles to be very careful and not spill any of the liquid when filling it and also to make certain to firmly tighten and drainage plugs to prevent such leaks to happen. Our planet needs all the help it can get. Please Watch your Step - when walking in the rain wet street, there may be one of these paintings about to be underfoot. I like looking at gas and oil when it starts raining. They always provide a cool shape and color. The blotch at the top reminds me of the old man in the mountain. I always thought those things looked like something from Ghostbusters. Very cool picture. You seem to capture the everyday things we recognize but simply pass over. It is so pretty. Initially I find that they take on vivid colors, but as the raid continues they seem to lose the color and begin to take on more interesting shapes. I think that is what you grabbed here.